After Governor Newsom introduced his first budget last week, CA Fwd applauded the new administration for learning from the hard fiscal lessons of the last two decades—and for introducing a spending plan that will prepare the state for the next, inevitable recession, while also expanding its performance-based approach to programs from housing to CalWORKS. There is more, much more, to like, however, about the state’s proposed $209 billion spending proposal. As the new governor likes to say, budgets are reflections of values, and there has never been a California budget proposal that so closely mirrors the priorities outlined in the Roadmap to Shared Prosperity—the sustainable economic development strategy updated each year by CA Fwd, the California Stewardship Network, and its partners in the California Economic Summit. The Summit launched its 2019 Roadmap earlier this month, bringing together the best ideas from every region in the state for taking on what the governor has called the “defining economic challenge of our time”—the need to combat rising income inequality, rising economic insecurity, and declining upward mobility. On issue after issue, the governor’s budget echoes Summit strategies for achieving this goal, from proposals to invest in early childhood education and a smarter safety net to detailed plans for encouraging forest resiliency, growing California’s skilled workforce, reducing the cost of housing, and helping communities tap the potential of new federally-designated Opportunity Zones. 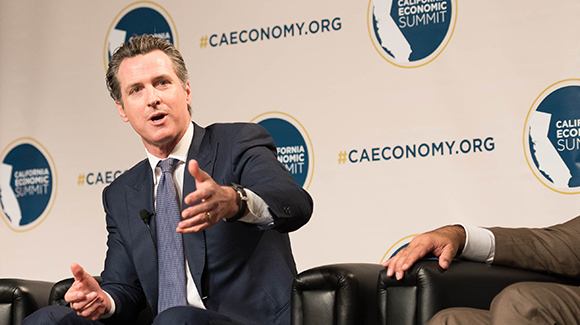 CA Fwd and its Summit partners will work with the administration and the Legislature to advance all of these critical issues—and to ensure the initial “down payments” the governor has proposed this year will put more Californians on the road to prosperity. Included below are some of the highlights of where the governor’s budget aligns with the 2019 Roadmap. Elevate CA: California’s steady job growth and low unemployment haven’t been enough to lift millions of people out of poverty. The Summit’s “Elevate CA” initiative is focused on expanding state efforts to help struggling Californians receive high quality services and move up the income ladder—from early childhood programs to new partnerships to transform the safety net. Early childhood: The governor has proposed to fund an expansion over the next three years of preschool programs for all income-eligible four-year-old children in the state—including $500 million this year to build needed childcare infrastructure. The budget also outlines a plan for achieving universal preschool for all children, including identifying necessary revenue sources. Expanding the safety net: The budget more than doubles the size of the state’s Earned Income Tax Credit, boosting to $1 billion a successful program that provides $500 credits to low-income families with young children. The program, renamed the “Working Families Tax Credit,” will also be made available to full-time workers earning $15 per hour—extending the credit to 400,000 additional families. Elevate Rural CA: Rural California leaders are working through the Summit to address three significant and inter-related priorities: increasing economic security for Californians stuck in low-wage jobs, transforming forest management to reduce catastrophic fires, and adapting watersheds and water systems to climate change. The governor’s budget advances all three of the major elements included in the Summit’s “Elevate Rural CA” initiative. Rural jobs: The governor made a point at his inauguration to emphasize the challenges faced by rural Californians. “I recognize that many in our rural communities believe that Sacramento doesn’t care about them, doesn’t even really see them,” Newsom said. “I see you. I care about you. And I will represent you with pride.” The governor’s proposed budget certainly reflects this, emphasizing the need to serve rural regions in programs from housing and homeless services to health care. Forest management: One of the budget’s biggest investments in rural regions is its $415 million in funding to improve the health of California’s forests and enhance CAL FIRE’s fire protection capabilities. This includes $213.6 million to complete fuel reduction projects and $200 million for forest thinning from the Greenhouse Gas Reduction Fund (generated by the state’s cap and trade program). Rural water infrastructure: With one million Californians, many in rural areas, still lacking access to clean drinking water, the governor proposed spending $188 million for infrastructure improvements that will help communities meet safe drinking water standards. The budget also proposes levying a new water fee to create a new Safe and Affordable Drinking Water Fund to assist disadvantaged communities with needed water investments. One Million Workers Challenge: To restore upward mobility and meet employers’ needs, California will require one million more graduates with bachelor’s degrees and one million more workers with middle-skilled credentials over the next 10 years. The Summit has pushed the state’s education and training system to work more collaboratively with employers to achieve these goals—helping create the successful Strong Workforce Program for community college career technical education programs. Community college funding: The governor’s budget makes it easier for students to access these successful programs by covering the cost of tuition of the second year of tuition—adding $45 million to the $46 million the state spent last year to make the first year of tuition free. One Million Homes Challenge: As more and more Californians struggle to pay rent or buy a home in their communities, the Summit has spent the last several years highlighting the need for California to build an additional one million more homes of all types in the next decade than are currently being produced. The Summit supported the adoption of the Legislature’s 2017 housing package and has pushed for an important missing piece: a fiscal incentive to encourage more jurisdictions to approve to housing projects. Fiscal incentive for housing: The budget proposes to expand the state’s housing production targets and create a new pot of funding ($500 million) for jurisdictions as they achieve these milestones. The budget also proposes linking housing production to certain types of transportation funding. Affordable and missing middle housing: The budget proposes to dramatically increase the state’s low-income housing tax credit (from roughly $80 million to $500 million). In a nod to the impact of rising housing costs on “missing middle income” Californians, the budget also includes a one-time $500 million contribution to a state loan program for developers building homes for households earning incomes of between 60-80 percent of their area median income. Opportunity Zones: To be competitive with other states, California has a narrow window in 2019 to take advantage of new, federally designated “Opportunity Zones,” low-income census tracts where investors can receive preferential tax treatment on capital gains. The Summit has been working with the administration and other partners to ensure these tax breaks will increase economic security and quality of life for the more than three million people living in them. Layering Opportunity Zones and EIFDs: The budget proposes combining the potential of Opportunity Zones with an existing state tax increment financing tool, Enhanced Infrastructure Financing Districts (EIFDs), which the Summit helped to create in 2014 and has been promoting ever since. The governor has proposed removing a requirement that EIFDs across the state obtain voter approval before issuing bonds funded by a portion of the growth in local property taxes. In Opportunity Zones, the budget proposes “layering” state programs and resources with EIFDs—and conforming state capital gains treatment to the new federal law—to maximize public and private investment in affordable housing and green energy projects, in particular. For more information on the Summit’s 2019 Roadmap to Shared Prosperity, click here. For a summary of the governor’s budget, click here.